Officially the Republic of Haiti, Haiti occupies the western, smaller portion of the island of Hispaniola in the Greater Antillean archipelago, which it shares with the Dominican Republic. Today, few if any Jews remain in Haiti. The first Jew to settle in Haiti, Luis de Torres, arrived in 1492 as Christopher Columbus’s Converso interpreter. After Haiti was conquered by the French in 1633, many Dutch Jews emigrated from Brazil in 1634. Most of these Jews were Marranos. Many became employees of French sugarcane plantations and further developed the industry. In 1683, Jews were expelled from all French colonies, including Haiti. Nevertheless, a few Jews remained as leading officials in French trading companies. After a few decades, in the mid-1700s many Jews, who had been expelled from Haiti, returned to the country. In 1804, during the slave revolt of Toussaint L’Ouverture, much of the Jewish community was murdered or expelled from Haiti. A few years later, many Polish Jews arrived in Haiti due to civil strife in Poland. Most youth did not grow up with a Jewish education due to the lack of a Sunday school or Jewish communal life. Children had to conceal their Judaism, because only Catholics could attend public school. Jews tended to settle along the shoreline, in port cities. Most Jews were involved in commerce and trade, therefore, establishing communities in major industry centers. A few years ago, archaeologists discovered an ancient synagogue of Crypto-Jews in Jeremie, the only one discovered on the island. Several Jewish tombstones have also been uncovered in port cities such as Cap Haitien and Jacmel. By the end of the 19th century, approximately 30 Jewish families arrived from Lebanon, Syria, and Egypt. During this period, a French law was enacted that gave French citizenship to minorities in the North American region; therefore, many Jews from the Middle East felt secure moving to Haiti. These Jews brought with them their Sephardic customs and traditions. By the time of the American occupation in 1915, roughly 200 Jews lived in Haiti. During the 20 years of American occupation, many Jews left Haiti for the United States and South America. Most of these European Jews remained in Haiti, grateful to the government, until the late 1950s. Many of the Haitian Jewry left, however, so their children could marry Jews and not assimilate, and to find greater economic opportunity. The 21st century witnessed a continued departure of Jews from Haiti, for the United States and Panama because of the poor economy and civil violence. Even after so many decades of living in Haiti, Jews are still considered foreigners in the country. Today, only 25 Jews remain in Haiti, predominately residing in Port-au-Prince. The community is led by Gilbert Bigio, a retired well-to-do businessman. Every Rosh Hashanah and Yom Kippur, services are held in his house. The last Jewish wedding in Haiti occurred 10 years ago, Bigio’s daughter, and the last bris was Bigio’s son, more than 30 years ago. Bigio owns the only Torah in all of Haiti, which he provides to the community for services. Israel and Haiti maintain full diplomatic relations. In 1947, Haiti voted for the United Nations’ partition of Palestine and the creation of the State of Israel. Many Haitians have a lot of admiration for Israel and its struggles. The Israeli ambassador in Panama represents Israeli interests in Haiti. Israel maintains an honorary consulate in Port-au-Prince. Currently, George Bigio is the honorary consul of Israel in Haiti, and flies a massive Israeli flag outside his home. In January 2010, after a devastating earthquake destroyed much of Haiti's capital, Port au Prince, killing more than 300,000 people and leaving nearly a million more homeless and without food or water, Israel was one of the first countries to send crews to assist in the aftermath. 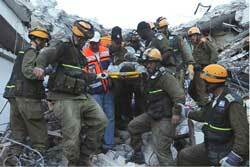 The IDF sent both search and rescue teams to try and find remaining survivors among the many rubbled building as well as medical teams to assist in caring for the survivors. The medical team succeeded in setting up the first fully functioning field hospital, inclusive of a plethora of advanced equipment. During its stay in Haiti, the delegation treated more than 1110 patients, conducted 319 successful surgeries, delivered 16 births including three by Cesarean sections and saved many from within the ruins. Following the conclusion of the IDF medical and rescue team operations in Haiti on January 27, the Israeli government decided to continue its official assistance to Haiti as part of the global effort of reconstruction of the country. The ongoing effort is being coordinated through MASHAV - Israel's Agency for International Development Cooperation, Ministry of Foreign Affairs. "Haiti.” Encyclopaedia Judaica - CD ROM Edition Judaica Multimedia (Israel) Ltd.
Rebecca Anna Stoil, "A Look into Haiti's Tiny Jewish Community," Jerusalem Post, (March 22, 2010). "IDF Delegation to Haiti," IDF Spokesperson, (January 2010).